Bread probably isn’t the first food that comes to mind when you think about lactose intolerance. Many bread products are made with dairy by-products, dried milk or whey protein. These ingredients contain lactose, which could cause digestive discomfort if you’re lactose intolerant. USA Today states that most adults are intolerant of lactose or allergic to milk to a certain degree, but only if you develop digestive symptoms are you considered lactose intolerant. 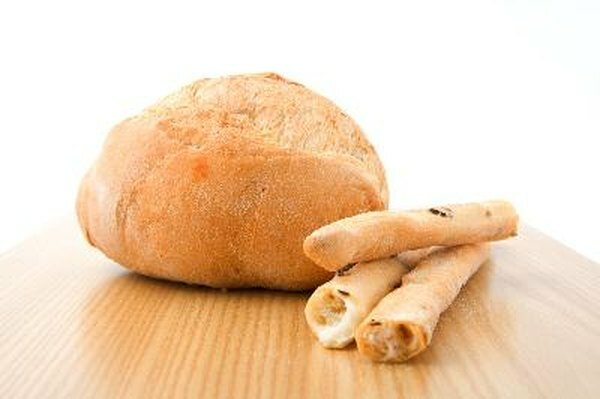 Before you eat bread, talk with your doctor about the safety of consuming it. In your early childhood, your small intestines produced a lot of lactase. Lactase is the enzyme that breaks lactose down into simpler sugars, such as glucose and galactose. As you age, your digestive system slows down the production of lactase because your diet isn’t predicated on dairy products. If your intestines stop making too much lactase, you may not be able to digest lactose, a sugar found in milk. Lactose is a common condition that is incurable but manageable through diet. Bread is commonly made with dairy products that contain lactose. If you have a severe intolerance to lactose, eating bread may cause symptoms to develop. Not everyone who is lactose intolerant has the same level of intolerance toward lactose. If you’re mildly or moderately lactose intolerant, you may not develop any symptoms after eating bread. Look for breads that do not contain any milk byproducts by reading the ingredients. Some bread may be labeled dairy-free. If you develop lactose-intolerant symptoms from eating bread you will notice digestive discomfort within the first two hours after consuming the bread. Common symptoms include bloating, gas, diarrhea, nausea, vomiting, foul-smelling stool, stools that float, abdominal pain and cramping. Although the symptoms are uncomfortable, there is no harm done to your digestive system. You should see your doctor if you notice blood in your vomit, your stool or you have severe abdominal pain. If you have not been diagnosed by a doctor, you may have celiac disease but think it’s lactose intolerance. Celiac disease is a digestive disorder triggered by eating gluten, which is primarily found in bread. Celiac disease can cause various similar symptoms, such as stomach pain, diarrhea and bloating. Celiac disease is a serious medical condition that can cause permanent damage. Prevent lactose intolerant symptoms by taking a lactase enzyme before taking your first bite of bread. The lactase enzyme supplement will help digest the lactose during digestion, preventing symptoms from developing.